That’s all she needed to say. I was sold. The next day I went on a search to find the most delectable marshmallow recipe I could find, and chose this one from Smitten Kitchen. I had never attempted making candy before so I was slightly intimidated, especially since I don’t have a candy thermometer. However, I’ve seen it done enough times where I figured I could wing it. Looks like I was right. This recipe is relatively easy, especially if you have a stand mixer (which I don’t — d’oh) and aren’t afraid of making a sticky mess. And — here comes a serious dork moment — I found that I actually really enjoyed the chemistry of the whole thing. I’ll spare you the geeky details, but let’s just say I think this recipe is pretty cool to make. If you haven’t tried homemade marshmallows, you must. They’re so much better than the store-bought version, although that’s not really a surprise — isn’t everything better when it’s homemade? All I need now is a bonfire. And in case you were wondering, I split the batch with Jasmin. It was her idea, after all. 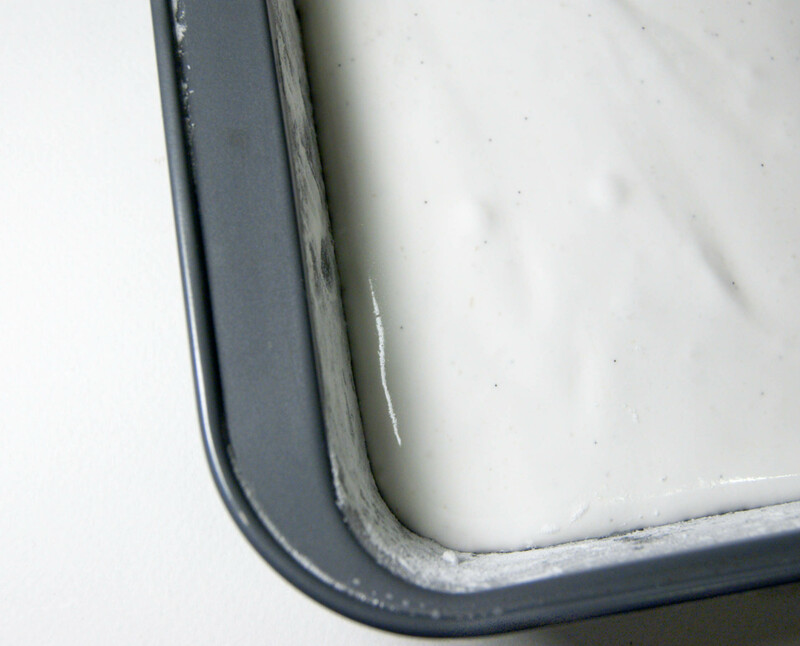 Oil bottom and sides of a 13″ x 9″ x 2″ rectangular metal baking pan and dust bottom and sides with some confectioners’ sugar. 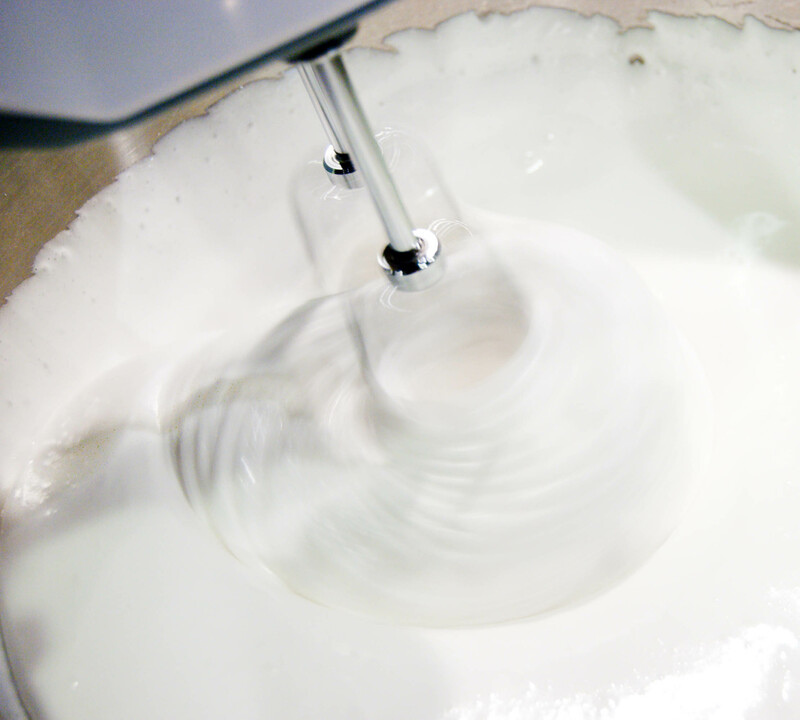 In a large heatproof bowl, sprinkle gelatin over 1/2 cup cold cold water, and let stand to soften. In a 3-quart heavy saucepan cook granulated sugar, corn syrup, second 1/2 cup of cold water, and salt over low heat, stirring until sugar is dissolved. Increase heat to moderate and boil mixture, without stirring, until a candy or digital thermometer registers 240°F, about 12 minutes. Note: I don’t have a candy thermometer, so I just cooked it for 12 minutes. Turned out fine. Remove pan from heat and pour sugar mixture over gelatin mixture, stirring until gelatin is dissolved. 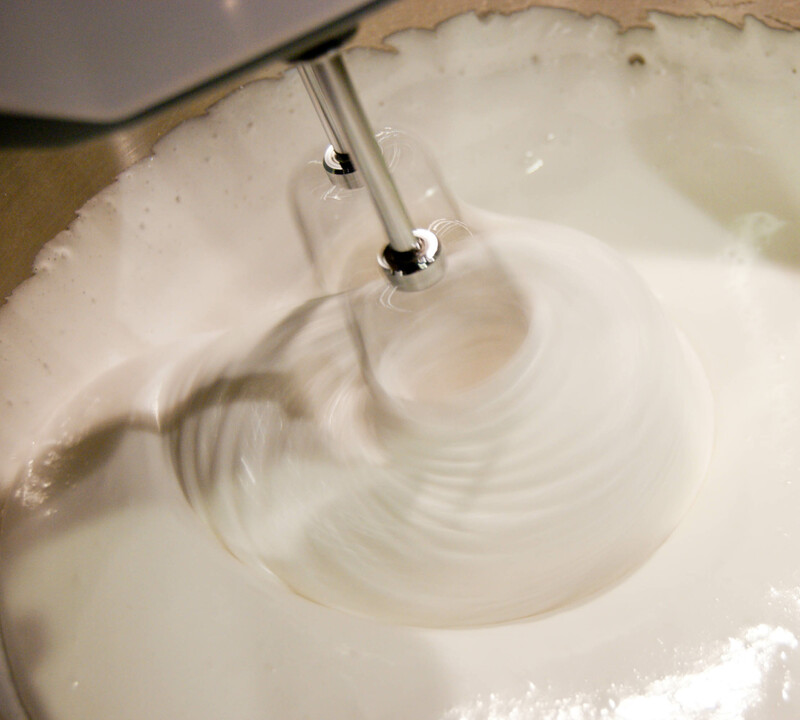 In separate medium bowl (with separate beaters), beat egg whites until they just hold stiff peaks. 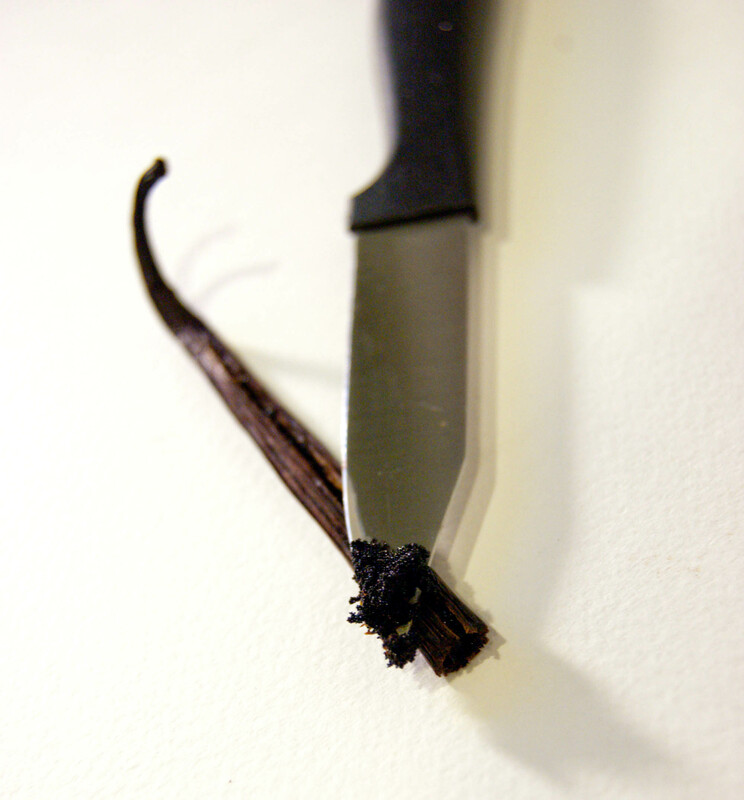 Beat whites and vanilla bean into sugar mixture until just combined. 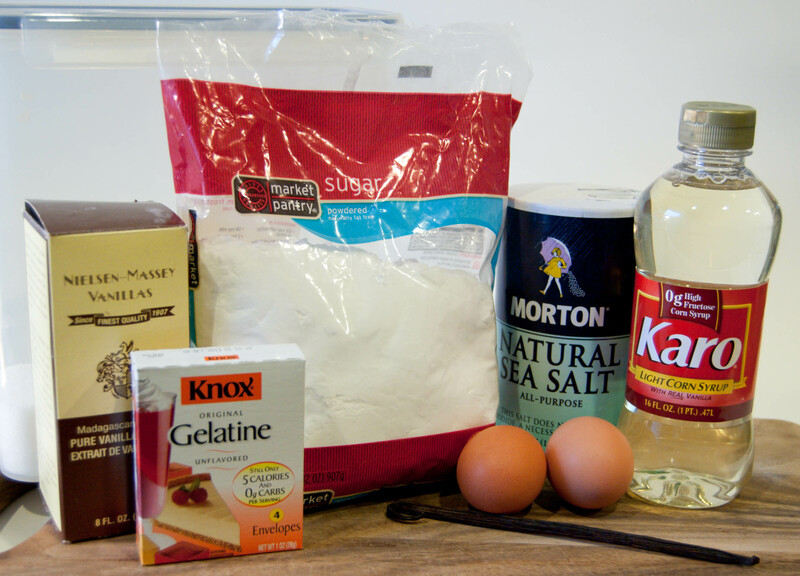 Pour mixture into baking pan and sift 1/4 cup confectioners sugar evenly over top. 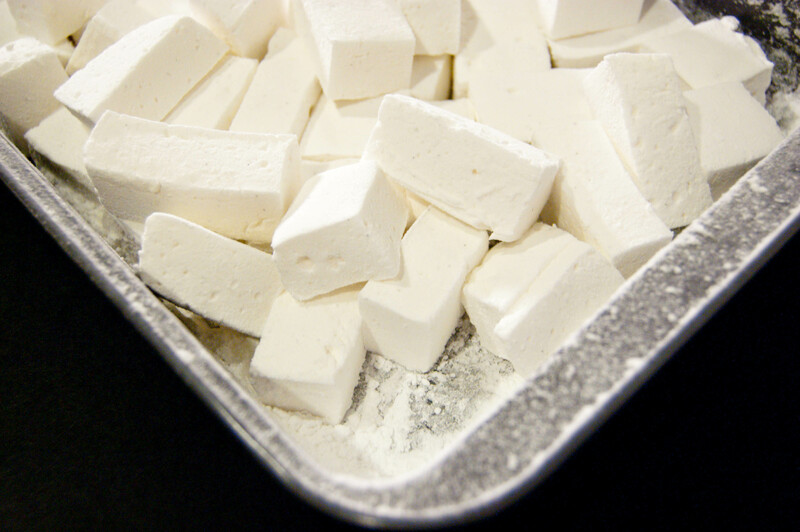 Let marshmallows rest uncovered at room temperature for at least three hours before cutting. Run a thin, sharp knife around the pan, loosening the marshmallow. Carefully invert the pan over a cutting board, and using your fingers, start to pull the marshmallow away from the corner of the pan. Work your way across until the entire marshmallow is released from the pan and is on the cutting board. 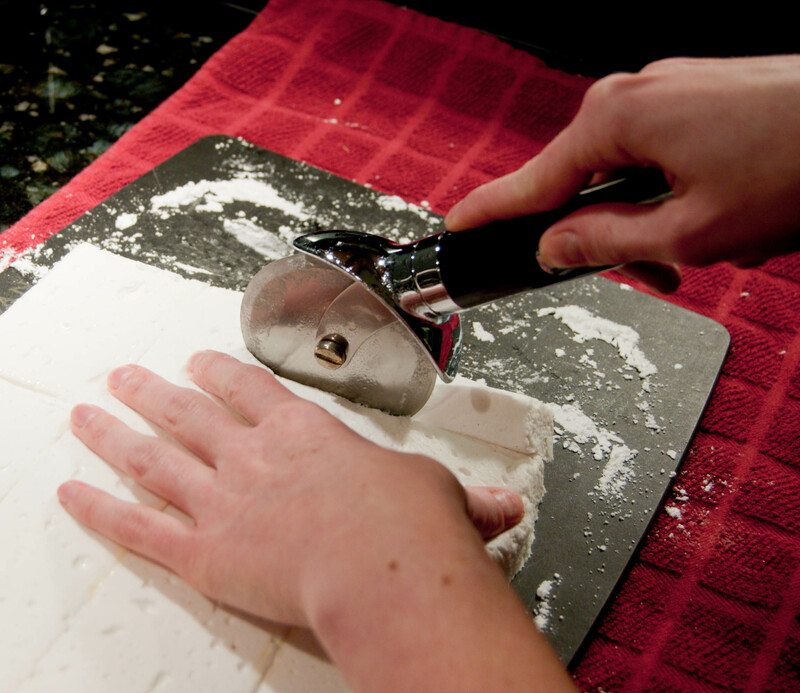 Using a greased pizza wheel, cut marshmallow into 1-inch cubes (or try to, anyway — mine are definitely off!). Return cut marshmallows to the pan and toss with an additional 1/4 cup of sifted confectioner’s sugar until well coated. Store marshmallows in a sealed container for up to one week. Hey, homemade marshmallows, maybe THIS is what I should do today with my kids. Brilliant! 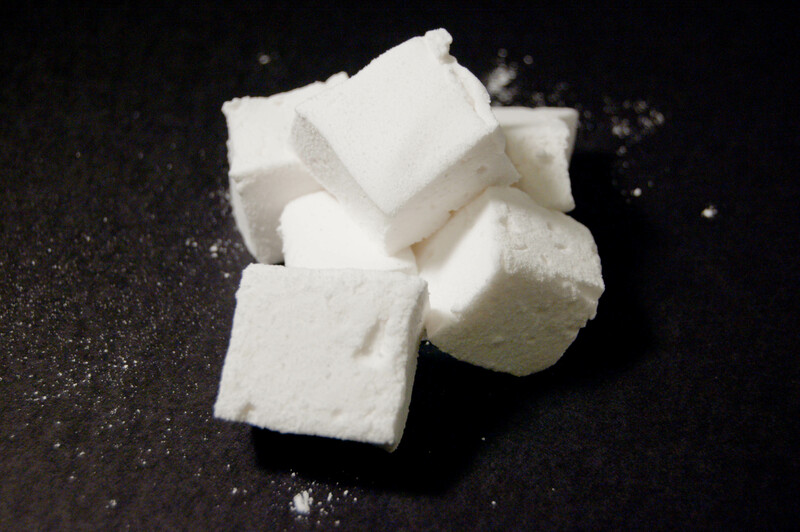 Hey Foodies, anyone know of a good vegetarian (gelatin-free) marshmallow recipe? Amazing! Homemade marshmallows are leaps and bounds better then store-bought one. I’ve never tried to make them, I’m too scared. But your 1st attempt came out so beautifully that I am tempted to try them out, too! I love your blog! I love how you experiment and try out different types of cooking and cuisines. Vanilla bean marshmallows sound like the perfect sweet for my sweet tooth right now. Keep up the great blog! Your marshmallows look amazing! I used to love making them with my kids..
amazing. What IS up with all of these oatmeal haters out there? I’d love to have a bonfire! But unfortunately, here in Chicago, I don’t even have a yard — the closet thing I’ll get to a bonfire is the flame on my gas stove! I too have often thought about making marshmallow but have never got round to it. Your instructions and pics make it look so simple I might just have a go! Thanks. S’mores kits! I love that idea. I hope you try making them again!